Two years ago when I needed the accessibility operations provided by the Architect of the Capitol (AOC) on the Capitol campus, they were there for me. Functioning escalators and elevators were invaluable to me as I recovered from knee replacement surgery. Thanks to modern science, I have a new titanium knee that, while it delays my going through metal detectors, allows me to use stairs with ease. Accessibility is a priority at the Capitol Visitor Center (CVC), the jurisdiction where I work. We work closely with the Office of Congressional Accessibility Services on a number of fronts. The tour of the Capitol is accessible to individuals with mobility issues, with elevators and escalators located close to the tour route. Visitor Guides and Visitor Assistants are attentive to people who need assistance and are careful to make sure that those who use the elevators quickly rejoin the rest of their group. At the U.S. Capitol Visitor Center entrance zones, fully accessible ramps sloping down from the east allow people with disabilities to enter the CVC along the same paths as pedestrians. Two elevators on the East Front Plaza adjacent to the entrance zones accommodate people with disabilities who may be approaching the CVC entrances from the west. Examples of touchable objects in the Capitol Visitor Center's Exhibition Hall. For people with low or no vision, the Capitol Visitor Center's brochures are available in alternative formats including large print, Braille, and HTML. Visitors may borrow listening devices with audio descriptions of the CVC orientation film and the documents and artifacts on display in Exhibition Hall. 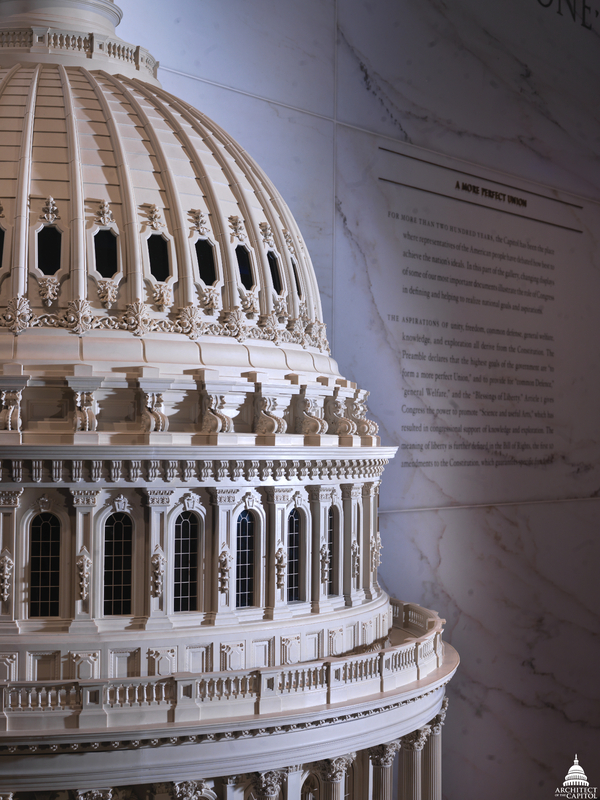 There are even a number of touchable objects in Exhibition Hall like the 11-foot-tall model of the Capitol Dome, decorative floor tiles like those used in the Capitol, and replicas of the snake door handles on the doors to the House Chamber. These items are especially inviting for people with low vision. An audio-descriptive tour of Exhibition Hall provides visitors who are blind or have low vision with a self-guided experience of the Capitol Visitor Center's exhibits. The nearly three-hour descriptive narration is available on a handheld device which visitors may request at the North Information Desk in Emancipation Hall. Visitors may also download the audio-descriptive tour onto their own personal device. As documents are changed in the display cases, the tour is revised accordingly. All of the films at the U.S. Capitol Visitor Center have open captioning, and sign-language interpreting for Capitol tours is available when booked in advance. Additionally, both the CVC and the Architect of the Capitol's websites are Section 508 complaint. This means that they are accessible to all users and are compatible with assistive technology, such as screen readers. These compliance standards were set by Section 508 of the Rehabilitation Act of 1973 which is where the label "Section 508" comes from. Section 508 requires that federal agencies provide software and website accessibility to people with disabilities. Visitors may request wheelchairs at the U.S. Capitol Visitor Center's North Coat Check. Additionally, the CVC provides continuous shuttle service from the southwest corner of Capitol Square to the CVC elevators on the plaza level for people with mobility issues. Our new shuttle vehicles have visual, structural and safety enhancements that provide a better experience for Capitol visitors, and also improve functionality for the shuttle drivers. The enhanced features include a wheelchair ramp compliant with the Americans with Disabilities Act (ADA) that is lightweight, durable and easy to operate. Passengers have easier access when they board the shuttle with overhead handles for additional leverage if needed. Finally, the U.S. Capitol Visitor Center educates visitors about disability issues by providing two informational programs about the ADA, which Congress passed in 1990, and the 1988 demonstration at Gallaudet University when protesters advocated for a deaf person to be named to the presidency of the university. Rest assured, as I did, that if you have a disability – temporary or permanent – you will be well taken care of on the Capitol campus.